Gorgeous reflections made easy! 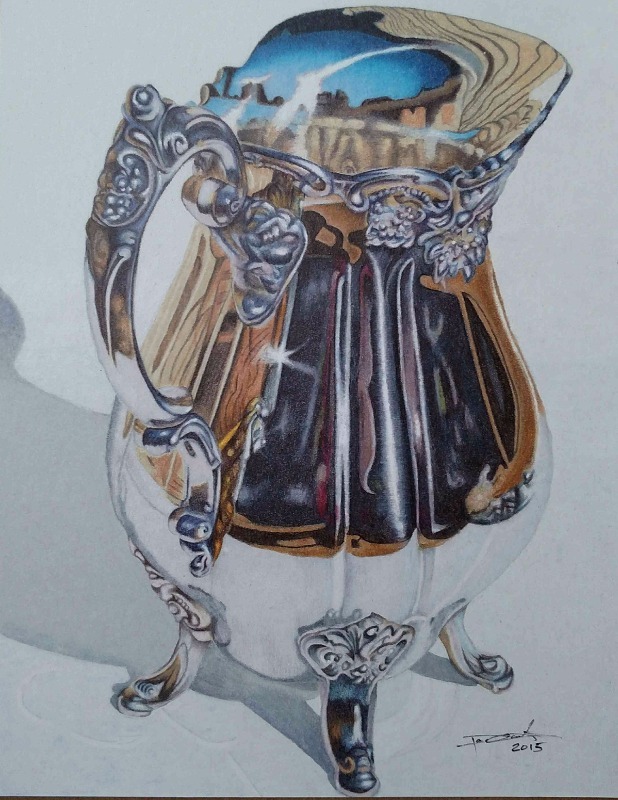 Master colored pencil artist Lisa Mills guides you on how to simplify the process of creating believable reflections with this astonishingly beautiful Silver Pitcher tutorial. Explore how to work on a new, different surface at the same time - white Colourfix Suede paper! This tutorial really is an "At-Home Mini-Workshop"! Printed in the USA. Publish Date: August 2013. - 2 sheets Colourfix Suede Pastel white drawing paper, pre-cut for this tutorial. First, let's get one thing out of the way. This project, like Ann's others, are not "adult coloring books." They aren't necessarily supposed to be "easy." I own every tutorial available through Ann's collection except for one, and it's true; this one is detailed and complex. After all, it deals with painting abstract reflections in shiny silver with a variety of pencil brands on a toothy support covered in powdered marble dust. The reason that this is probably my favorite of all of the project kits is because of its complexity, and because of the results I achieved and the things I learned when I FOLLOWED the directions, which were perfectly detailed. I deeply enjoyed that the author went to great pains to explain the properties and appropriate uses of the three types of pencils (Prismas, Luminance and Pablo) recommended for the kit. She even explained the difference in composition and clay versus wax content in the two wax based pencils the kit requires. The Luminance pencils are expensive and well worth it. The Colourfix support is expensive, and yields a result with this kit that isn't possible with any other support of which I'm aware. It took me nearly a year of off and on weekends to complete this kit as a new artist, and I wound up with a piece that my younger sister now displays in her home. More importantly, I learned many techniques and about several pencils and support to which I wouldn't have been exposed in any other kit available. I recommend this kit to anyone wanting to learn in depth about producing photo realistic reflective metal. I simply loved working through it. Probably not the best kit for someone wanting to just **** some time "coloring," but the latter isn't the target customer for this kit. No matter what your experience level, though, a bit of patience and a lot of following the directions will yield spectacular results that will surprise you! I recently purchased this impressive tutorial and love the booklet and its packaging. Thank you for keeping your standards high and offering such a wide range of educational products in the colored pencil market! I do step by steps often and this one was purchase to do metal. I truly could not get past step 3 and the other steps were generalized. The thumbnail reference photos are so bad. If I enlarge them in any way, they become so distorted. I see can't any of the marks from the drawing at all. I'm hoping to figure a way to render them at a higher dpi, otherwise, it's just not going to be with the effort. I must add that is the main complaint along with the pencil list. The pencil list is common place but yucky, I agree and the materials are shown in the preview. With that said, this tutorial has received 5 stars mostly from individuals who haven't even began. If the thumbnail references get fixed, this will be a dream. We are terribly sorry for your disappointment with this tutorial! We are happy to exchange it for something else, if you'd like? Or we'd be happy to refund you, if you'd prefer. I am going to try and send you the highest resolution possible, that we have, of each of the step-by-steps for this tutorial. These will be coming shortly, via email attachment. If they will not suffice, please do not hesitate to let me know how we can make you happy in this situation.